Sandwiched between two fantastic crossings of the Long Island Sound from CT was a visit to Prime Restaurant in Huntington to enjoy their Sunday Jazz Brunch. The restaurant offers outside waterside tables in a relaxed environment plus more formal tables indoors. On this visit we were a little late for the first come first served tables on the deck and we were seated at a very quiet table next to the windows in the rear of the dining area where we could enjoy conversation with jazz in the background. The Sunday Brunch menu consists of salads, maki rolls, eggs, and sandwiches, or dive into Prime’s famous and enormous steaks. I ordered the “Prime Burger” that includes a large 8 ounce patty, melted cheese, a slice of tomato, thinly sliced red onions, and lettuce on a brioche with a side of shoestring fries. The burger was served on a wooden carving board, masquerading as a dinner plate, with the large order of fries assembled inside a wire basket. The burger was held together with a bamboo spear adorned with a cornichon. I first grabbed few fries. The few on top were a little cool from sitting, but the next layer were hot, crispy, tasty and nicely salted. I next removed the onion slice (I am not a fan of raw onions) and cut the burger in half. It was perfectly prepared to my requested medium-rare. Likewise the kitchen prepared the bacon to crispy, but not overcooked. I pulled a little of the patty and tasted. The meat was deep in flavor, seasoned properly and excellent. My first bite of the entire construction was delicious. The meat worked fantastically with the sweet tomato and the crispy lettuce was very refreshing. The bacon added just a touch of saltiness and a little smokiness. The roll was good, but it was not in the same league as the other ingredients, that would be my one suggestion, upgrade the bun, the meat deserves better. We finished the meal with a single slice of cheesecake, topped with chocolate and caramel sauces. I was the only person at the table that was not fond of the cheesecake. I thought it was too gelatinous versus the creamy delightfulness of traditional NY Cheesecake. Overall, it was a beautiful day on the Sound, a fantastic burger and a great time with friends. 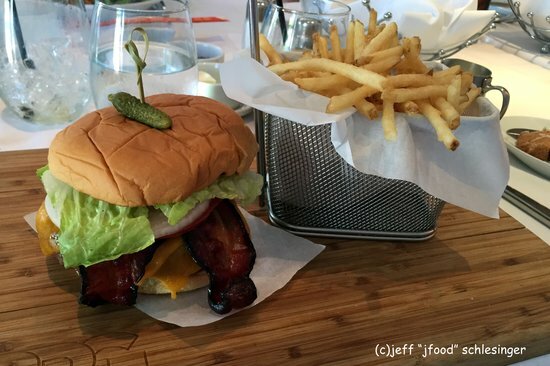 This entry was posted in Uncategorized and tagged hamburger, Jeff Schlesinger, jfood by jfoodeats. Bookmark the permalink.